An image of a man dressed in a jersey that says "Stoneys Car Market". The man in this image has been identified as Lloyd Wilfred (Doc) Dafoe (1917?-2001) a back catcher with the "Royals" softball team in Whitby in the 1950's. According to Mike Filey in Toronto Sketches 8, pg. 114, there was a Stoney’s Car Market in Toronto, “a popular used car lot” which was located in the early 1950s at the intersection of Danforth Avenue and Jones Avenue in Toronto. 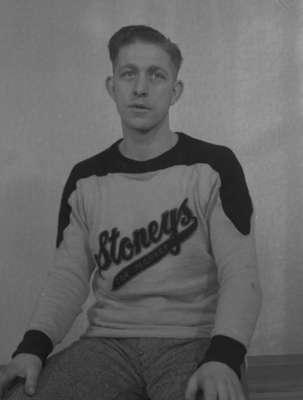 This may be the same "Stoney’s Car Market" that is named on this jersey sweater. Dafoe Portrait, 1947, Marjorie Ruddy. Whitby Archives A2013_040_1055.